In Mobile Video Machine Learning KRAKEN, the “Birdman” Case study demonstrates video lift engagement powered by machine learning. In “5 Ways Machine Learning Accelerates Mobile Video”, we dive into why brands are embracing video as a key marketing and storytelling tool and how machine learning can be used to drive higher engagement. The hard reality is video is STILL LINEAR. Even so, some are attempting to make them interactive like Jack White’s Interactive Video that allows viewers to choose their own adventure. Case study on the movie trailer “Birdman” Click to play lift achieved 3000% using machine learning technology. Publishers are looking to achieve high KPI’s in order to increase overall spend while the media buyer is looking to lower CPA, without increasing costs. Publishers are trying to increase inventory and get the most out of their customer’s engagement. Machine learning enables both parties to achieve their goal by impacting revenue, efficiency and effectiveness simultaneously. With this technology publishers are empowered to keep the user video engagement high over significantly longer periods of time which is proving to be an invaluable tool that will become imperative to all successful video marketing efforts. What Marketers want to see? Google research finds only 53 percent of PC video advertising is viewable. Gone are the days of simply tracking web page hits. A more sophisticated marketer has emerged where data is king. However, video distribution and analytics are complicated. Machine learning facilitates the systems ability to learn behavior and automatically adjust marketing efforts based on active feedback loops. This virtual neural network driven by human interaction with video content creates a meaningful data set providing the foundation for mobile video intelligence. Graph shows real-time A/B testing of static image and KRAKEN image driven by machine learning. Machine learning makes it possible to stabilize and achieve lift. Programmatic targeting reached an all time high of sophistication with it’s own machine learning and big data approach. Companies like RockFuel, Turn and eXelate have all perfected audience based targeting with advanced machine learning methods of aggregating massive sums of data to ensure that the right content is placed in front of the right people at the right time. The following are examples of machine learning techniques being used to enhance content engagement levels. 1. Algorithmic learning is used to determine what demographic segment responds well with specific content (e.g. videos). 2. Identification of habitual responses to visual objects by region allows for higher confidence of consumer engagement with content. 3. The type of content greatly affects the reaction of a targeted segment. Machine learning can track the visual preference of the video segments to give brands and content creators a new level of understanding as to what an audience will find most appealing. 4. Machine Learning can predict audience consumption. Plotting audience behavior across video types creates a consumption map, which can be used to predict things like video placement and cycle times. 5. Reduce video fatigue and increase engagement by rotation of static video images (thumbnails). Static starting images face image fatigue due to a lack of visual changes, color and motion alterations. Continuous and dynamic changes in a static video image will increase audience interest and result in higher click to play rates as well as completion rates. Netflix has the capability to “predict” what you would watch next based on past viewing habits. Information like show/movie title and genre are compiled to help select Netflix’s recommendations. These algorithms are an example of something that pulls from the surface level information vs actual content within the video. Visual content marketing is a very powerful method of attracting and retaining customers. Building a content story arch is key to perpetuating engagement and video is the most effective means to accomplish this. Publishers that leverage their audience to tune the video will achieve higher levels of revenue on their existing assets. How do you see machine learning impacting video in the further and what video KPIs do you track that aren’t on the list? Let us know in the comments! Video is the largest and fastest growing segment in online marketing. Unfortunately the first impression to a consumer of those videos is more than likely a static image and there isn’t a simple way to programmatically adjust based on audience intelligence. This problem is leaving billions on the table with un-played videos and lost engagement due to the lack of compelling starting visuals. “In a highly competitive Ad Tech space, where videos drive the lion share of revenues, InfiniGraph’s technology, Kraken, is the first real breakthrough we have seen in many years. Our beta customers: Disney, Paramount, Microsoft and AnchorFree have experienced between 10% to 3000% lifts in click-through and play rates on their video content using InfiniGraph’s patented Kraken technology..
InfiniGraph’s machine learning technology, achieves scale by producing the highest possible response to mobile video based on audience behavior. Improving mobile video play rates is more of a science as seen in the second example on AnchorFree running “Birdman”. Is your video “Thumb Stopping” when a consumer scrolls through their feed? In the case of Birdman, the results were amazing. The Kraken machine learning system is continuously analyzing the video and user interactions at every content distribution endpoint, over many sequences. This decision making is done almost in real-time. InfiniGraph’s mission is to help video content owners, publishers, and agencies deliver the most relevant video experience. This helps boost video starts, video completion rates, and increases page visit depth by eliminating creative burn and waste. This translates into higher revenues for the existing content through higher video starts, higher VCRs, and higher brand engagement. Our clients, who have implemented proprietary “video click-through / play rate enhancement technology called “Kraken”, have experienced upwards of 3000% lift in content plays. As an Advertising, Content Producer, or Brand Management Professional you know that video creates the greatest impact to your online marketing. The challenge and measurement of success continues to be execution of “play-rates” and “video completion rates” . Paramount’s Interstellar uses mobile native video and distributed native advertising units to hyper jump their play rates by 14X. Mobile video is exploding and brands are leveraging advanced methods of distribution outside of the old school static native ads we are seeing today. We are now in the age of intelligence, machine learning, and responsive design. Why can’t this intelligence be applied to mobile native video? Learn how to hyper drive your own mobile native video – signup, request a demo, and see how intelligence is applied. Above is an example of such intelligence integrated within the mobile native advertising unit for on and off domain content amplification. The mobile video leverages “deep linking” to launch video on a smartphone creating a seamless consumer experience. The content inside the native unit is dynamically updated based on consumer actions which increases overall engagement rates and exposure. Most brands are sitting on tons of great content. This content is usually stuck in silos and doesn’t have a simple way of tracking with the consumer across other media sources, such as a websites/blogs (owned), and other paid mediums. Ad re-targeting is extremely effective; however a major issue is visual ad fatigue. The consumer sees the same media over and over, eventually reducing effectiveness. The Industry benchmarks on rich media content averages around .06% to .10% CTR compared to native ads which perform much higher. With new intelligent data techniques harnessing machine learning, these technologies are pushing engagement rates up to 50% improvement. Content Marketing has truly taken on a new life and the quality of content within videos has leaped to extraordinary levels. As more publishers and brands are seeking to control the content on their site, white label native ad platforms will continue to take hold. The example on the left demonstrates what an embedded native unit looks like when deployed over a publisher network or brand website. The code behind these units is designed with a mobile first strategy, assuring optimal rendering on mobile. 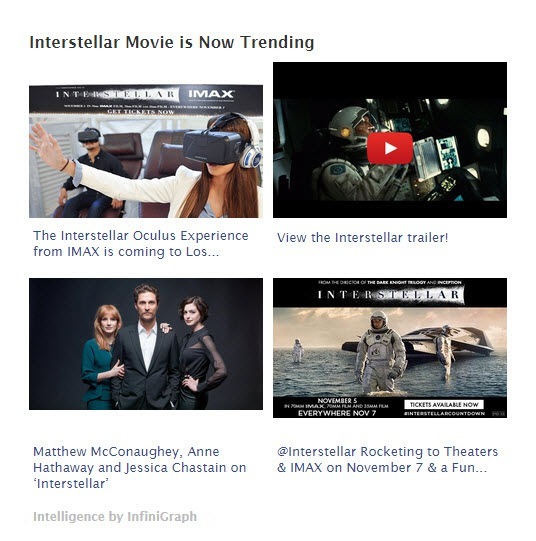 InfiniGraph sources content from the existing Interstellar movie published content, scores the content and transforms it into intelligent mobile native units. What’s unique about this approach is the consumer actions on content are tracked and the brands content inventory is managed per individual unit to maximize content marketing spend. Keeping content fresh is a major factor in reducing image fatigue, repetitiveness, and inactive engagement. The human brain can process images in 13 milliseconds, how fast your visuals resonate with your consumer is key to amplifying brand content on domain as well as enhancing off domain engagement. The same mobile native unit can be deployed over other 3rd party native networks, ad networks, programmatic exchanges, and on the brands domain simultaneously. Apply some intelligence in your mobile native video – signup, request a demo and see how intelligence is applied. No wonder controversy has peaked with talks of YouTube being second fiddle and the emphasis of video on the other big social platforms. This video hypnosis strategy is being perpetuated by brands as static visual display gives way to 30 frames a second story telling. The mobile consumer has put in motion an explosion of new tools, data insights, and techniques that brands must embrace to be competitive. There’s no question video is not only killing it for the brands but every person is a video content author now. This is changing the way content is being created, shared, and consumed. In a previous post, 5 ways to weaponize your mobile content marketing via native advertising, I addressed the channels and solutions brands must consider to scale their content marketing. Recently, major bets have been placed, such as Yahoo acquiring BrightRoll for $640MM and Fox acquiring TrueX for $200MM, making the importance of mobile video to the ad machines clear. Mobile, video, and native advertising are top priorities, according to top ad executives. Consumers have an insatiable appetite to consume mobile video, as described in 5 Electrifying content marketing methods via native advertising. Now, the stage is set for mobile video and native advertising to erupt in the digital ad landscape. Native advertising hyper growth: From 2013 we have had a 29% growth with eMarketer projecting $3.1 billion in spend. Publishers are holding the fort, like Forbes and LinkedIN Pulse with their mobile app. The mobile platform is ripe: Smartphones are fueling this mobile video growth, powered by higher bandwidth on wireless networks, broader wi-fi access, incredible processing power, monster memory, high-definition screens, HD cameras, and killer optics. There are also a plethora of video editing apps making it easy to create and deploy high quality video on the spot and distribute it with just a click. Longer-form video is desirable: Consumers are shifting to rich experiences with greater tolerance to video advertisements. Greater than 20 minute video content grew 86% year over year and shorts from less than five minutes all the way to 20 min clicks experiences a 22% growth reported by FreeWheel. We have now entered the trifecta of mobile, video, and native advertising, creating a great opportunity for new mobile native video delivery mechanisms that would work well in the confines of editorial content and optimized over many form factors. As this popularity builds for mobile native video, the brands and content creators who streamline delivery will ultimately win. The consumer is hungry for great content. The right placement of mobile native video makes a formidable strategy. 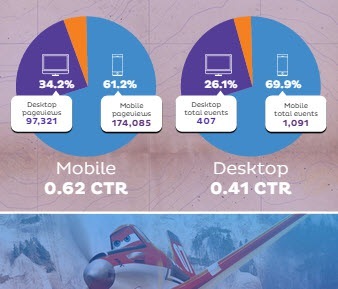 In the Disney Planes case study, mobile native video produced 70% higher CTR over the desktop native unit of 26%. With 66% mobile users being more likely to interact with a video than those on a desktop demonstrate why there is some much talk on mobile first strategy . Consumers are highly trained now (like a Pavlovian dog) thanks to the many video apps and video enabled feeds. When a video ad appears prompting interaction, consumers are more likely to participate due to the reward of great content. This drives the higher share volumes we see on experience based content. These results are very encouraging for brands developing cross-screen campaigns. Analyzing thousands of brands and their video posting behavior along with consumer interaction creates unparalleled insights as to what brands need to do, and the level they must play at to be in the game of mobile native video. Here, we compare top brands and the volume of video they are creating along with the engagement on those videos. Don’t assume video plays is the best measurement of video effectiveness. Brands are looking for full consumption and engagement resulting from the content. The ratio of shares per post has been found to be a great measurement of comparing a brand’s consistency and quality factors. 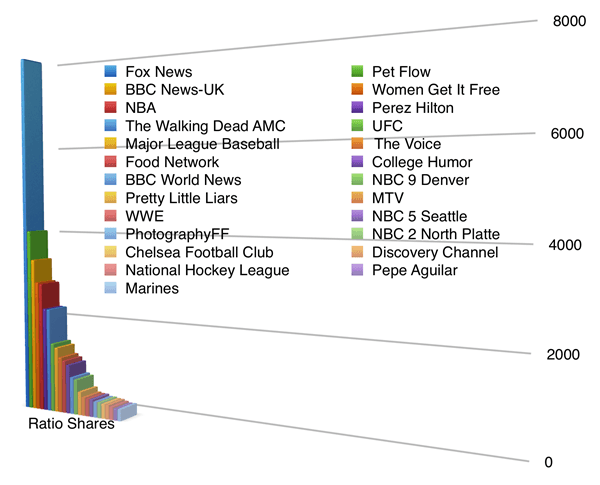 The share per post ratio over the past year shows Fox News, PetFlow, and BBC News lead the way along with traditional video based TV news properties dominating the social video landscape. Where Women Get It Free is head to head with NBA! Those media outlets engineered to naturally produce video content will continue to see an increase in their dominance. There are challenges at the moment with video chicanery such as autoplay and paying for plays that skew the real numbers, however, people commenting, liking, and sharing video provides hard attribution to go from. Be careful on plays, there are so many services out there that will get you PLAYS for cash, like the old days of buying friends and followers, but it’s hard to fake shares and authentic comments. Unfortunately, we’re seeing ad fraud in the billions and that’s coming to mobile native video. Facebook autoplay still playing an ad when hidden under the fold will not build confidence. What’s it going to take to be in the top mobile video advertising game? If your brand is among one of the industries we have analyzed, the bar has been set very high. The chart above provides a view into the amount of content required (video posts) and the reach / share levels of engagement required. The main takeaway question is does your CMO or CEO know the commitment level to be a top player in video? Recent deal such as Target and Best Buy with True[x] clearly shows marketers are moving media spend from banners to the native ads. The data don’t lie with the response on native over social networks and other publishers preferring in context rich media, video, and visuals as part of the ad experience. Likes on video is not the same action as sharing to your friends. Consumers willing to stamp their name on something with greater emotion tend to share or comment. That is why these tend to be the best hard attributions besides click to purchase. The WWE, UFC, MLB, and NBA skew towards male users where Women Get It Free, PetFlow, Prez Hilton, and The Voice skew female. It’s well know that females share more, and the data on video proves that to be true. There has been a great deal of hullabaloo and hype about how Facebook has passed up YouTube, and how Yahoo is overtaking Twitter in mobile ads. Some have claimed it’s all lies. The reality is, consumers are sharing video in a big way. In fact, as the data has shown, there are more shares than likes on videos. Here are five ways brands can leverage these 2015 trends that will define high performance content marketing efforts and help brands get a jump on their mobile native video advertising strategy. The smart brands have created newsrooms and command centers, driving content creation to the next level with full on video production. Data will be a driving factor to the competitive advantage. Knowing what consumers engage with and what they click on is a gold mine. Many technologies enable you to understand your competitive content landscape. Over the last four years, we have seen a steady increase in mobile activity due to native apps and responsive web content. 2014 was truly a breakout year with many experiencing as high as 60% and 70% shift to mobile. In 2015, brands must focus on useful mobile experiences for content and commerce. With 66% increase in CTR over desktop, it’s easy to see why the ROI justification on mobile is simple. Think of what works best for mobile and where your consumers are consuming your content. Content designers must realizing that not all consumer are in front of a TV. What are you looking to achieve on mobile and is the video designed for the mobile experience? Mobile, social and video are the hottest trends and will commandeer big spends as the quality and complexity of story telling continues to rise. The consumer is mobile and the experience has to shift to the medium where they are at making the challenge of the creative fit the form factor. Marketers are increasingly being pushed for verifiable results over the simple view or play. Viewability is now a must-have for brands to be assured their content is being seen and engaged with. Next year, it will be all about video engagement. We’re quickly moving beyond YouTube and seeking out customers in their native environments. Marketers would be wise to customize ads for each device, because those type of ads drive the best results. This is back up by data we see and also by a study from video advertising firm Innovid, which analyzed video ads over Crackle’s network consumer base. The study combined pre-roll and interactive video ads across auto, retail, CPG, entertainment, and travel for one-year period on desktop, mobile, and iPad. Optimized ads can deliver a six times increase in engagement, seven times boost in click-throughs, and a 25% rise in completion rates, the study reported. The thumbnail image is one of the most critical images because it is the first image consumers see. Studies show optimizing the thumbnail image can increase CTR’s from 5 to 30%. A new startup called Neon coming out of Carnegie Mellon University is using advanced video analysis techniques to determine what thumbnail or text in combination would yield higher CTR. Working with IGN results have even gone as high as 59% increase on highly customized thumbnails based on cognitive sciences. Overall, brands will see the best results when an ad is optimized for the screen and the thumbnails are well crafted. Brands must prepare for the multi modal customer and engineer for omnichannel to stay in this high stakes poker game. Facebook now how Premium video along with the auto play and pushing video over all other post their drive for dominance is self evident if you’re on Facebook. For Facebook this was always in the plan to debase YouTube video dominance. Morgan Stanley projects Facebook video ads could to be worth $1 billion this year and rocketing to $5.5 billion by 2019. And now Facebook is creating a YouTube like experience going head to head with the more static non social YouTube. We could be witnessing a move over old school video channels. Viewability and attention as the key measurements now over just clicks are views. Brands what to know is their ads being engaged with. Google recently announced 56.1 percent of ads on the internet are not view-able. See infographic too. A revolution like the editorial content mixing with ads “native” is now happening with with video where rich media meets polished ad copy all engineered as entertainment. As mobile native video takes hold there will be a best in class native ad structure. The melding of native ad content and video will give rise to a more interactive experience customer want to watch, willing to share and engage on. Over the last three years growth in brand mobile videos has skyrocket with 73% from 2013 and sees to top over $4.4 billion in 2018, and mobile video ads will grow almost 5X faster than desktop. We will see a migration of desktop ads to mobile, which is a no brainier. And mobile video is just add water for advertisers’ video ad assets created for larger screens. The number of videos does not extrapolate to overall levels of engagement however. It’s easy to see the growth of top brands and their acceleration will continue as long as consumers keep consuming. Democratization the video creation and dissemination process has lowered the barrier for any size brand to enter and establish a video footing. Facebook Mobile Ads Are Brands’ Best Bet for Holiday Shopping Season -With the holiday shopping season fast approaching, new research from advertising technology company Spongecell indicated mobile ads are the way to go. Loading video is now as easy as taking a picture. If a picture is worth a 1000 words with 30 frames a second and audio to boot makes 1,000,000 words or so, Right? Video Selfies funding demonstrates even VC’s are ready to capitalize on the fastest-growing sector of mobile advertising and is attracting big brands looking to leverage their heavy television media buys. We’re quickly moving past the 15 and 30 second to full-length creative content streams. Mobile ad spend is growing rapidly, but brands who invest in mobile-ready solutions now will win. By getting ahead of the trend, brands will be able to understand, experiment with, and become market leaders in mobile advertising. Tell us in the comments how your integrating video into your content marketing and what’s working. All brands must have content amplification, both mobile and native advertising, in their content marketing arsenal. Beyond the hype, native advertising is one method showing great success at scale and it’s here to stay. Regardless of how amazing your content is or who created it, if you don’t have a clear amplification and execution plan in place, getting above the noise is near impossible. In this webinar we’ll dive into the 5 ways to electrify your content marketing, using data and reviewing effective native advertising methods. Brands have to wake up and focus their content to achieve higher engagement throughout the consumer’s path to purchase or risk losing TOP OF MIND to competitors that are capturing greater market share. Learn how to amplify your content all the time. On and off domain content amplification. What’s native advertising? Scale in context. How to mobilize your content marketing. 1. We’re in a content deluge. We’re in an era where the volume of content creation and dissemination is at an all time high with no signs of stopping. The old saying “drinking from a fire hydrant” is an understatement. The sheer volume from so many channels is creating a media surplus. This mountain of consumer engagement insight is where lots of the buzz comes from regarding big data. The brands that harness this data will dominate pure and simple. Content is omnipresent. There are no shortages of devices either. Everyone is a content creator, which adds to the noise. 2. There is an attention deficit. Your customers are very distracted and most are multitasking over many apps and receiving content notifications frequently. Both on and off domain distractions complicate your ability to increase time with your customers. Consumers are mobile and vying for their attention in this digital ADD world pushes some brands to extreme content marketing. Brands must stay relevant and create compelling, share worthy content at a clip like never before or risk becoming irrelevant. 3. Tunnel vision is a requirement. Consumers are looking for or engaging on specific content and brands must have some tunnel vision too. People can barely consume, much less comprehend, 285 pieces of content in a day. Multitasking and multiple devices is a cultural norm requiring a higher degree of content stickiness. We only want to consume content relevant to us at a very specific moment in time. Tunnel vision helps us do that. 4. The customer journey is unpredictable. It’s complicated to say the least. Consumers are being influenced and the path to purchase is based on many online and offline factors. Most of us embark on an open-ended purchase path and our content consumption patterns change daily. The above was inspired by a Michael Brito slideshare. Brands spent $110 Billion on Content Marketing in the last 3 years, yet the interactions by consumers on that content is low. Content is stuck in silos across the web / mobile / social / blog channels and lacks context over all consumer touch points. Is your content disconnected? Above is a great example of a top content creator’s precipitous decline in social engagement. Disney continues an exponential increase in it’s content creation and post rate as seen in the graph above, however, the two graphs on the right prove engagement has leveled off and that social shares have declined over the past 3 years. The data demonstrates consumers haven’t stopped engaging but there are so many other avenues to choose from. What’s exciting is that all this content and the data from social channels sets up a data bonanza for the brands to harness. Data on your customer content and consumer behavior is not a nice to have but a must have for any modern digital marketing effort. You must have a clear understanding of your audience and what’s relevant to them or your marketing message will fall flat. Consumers have many interest graphs across many networks today. For marketing automation and personalization, graph data is paramount for relevant content personalization. Better engagement through better content marketing insights is the focus. Brands have to look across their paid, owned and earned channels and understand the underlying interest graph of interconnections. Anyone of these channels can go viral. The facts are most all content now has a social share function integrated with delivery or as part of the content itself. Hard actions on content can now be measured vs. social mentions or the amount of views/traffic a property obtains. Using engagement performance and applying scores on content now enables content marketers to benchmark over many sites/channels within the same content category. What’s unique? All content has gone social enabling interest graphs to be created on your customers. This data provides deep insights into what’s resonating and shared based on type, source and brand identity. Brands require an innovative approach when creating and distributing their visual content, especially on mobile. Pinterest style layouts are proven to be highly effective in increasing consumer engagement and discovery. Smart brands are combining these vector scaling adaptive layouts and harnessing the consumer behavior to their advantage. By surfacing real- time trends to induce higher engagement wherever the consumer is, targeting and personalization are no longer nice to haves but the key to customer retention and conversion. Different brands and businesses have different content needs and preferred methods of engagement. Identifying your content mojo is a big part of an amplification strategy. Brands with clear understanding of how their prospects, customers, and advocates interact across these media elements have an opportunity to retain or gain market share. We’re now in an omni-channel world and have to look at the customer in a new way over all brand touch points. Using omni-channel retailing while working with the “Connected Consumer“, all shopping channels work from the same database of products, prices, promotions, etc. Instead of perceiving a variety of touch-points as part of the same brand, omni-channel retailers let consumers experience the brand, not a channel within a brand. Merchandise and promotions are not channel specific, but rather consistent across all retail channels. If you want to be in the game you must have GREAT content – to start with – not a product promotion but a real story around client success. The best content is that being created and re-purposed over many channels over and over. Be realistic on the volume of content you need to create. Insights on what your industry is creating and the volume to stay relevant is readily available over every industry. Don’t complicate you content marketing creation process there are ample examples of what’s effective and what consumers are willing to share. Every part of your content marketing cycle has great importance. For this post we’ll focus on the promotion side of content marketing. A big step is defining your objectives and data you want to obtain ongoing. Not just reporting but a plan of action over each promotional channel. Next, must have a rock solid monitoring strategy and a plan to use the data to drive your decision process. Without these you’re just guessing and wasting time. We found partnering on the eBooks creation process to be highly effective for thought leadership, lead generation and very lucrative. Who is part of your content and the quality are critical factors. Here are a few eBooks we created with top content marketers. All our eBooks have blog posts associated with them as well as paid amplification program. Beyond our co authors tweets and reach, we leveraged native ads and found them to be highly effective in reaching our intended audience. eBook also provided us with big rock content we used to repackaged and amplified over many channels. For more on this topic get Jason Miller’s “Welcome to the Funnel” he is the god on content re-purposing and big rock content. Paid content amplification is a must have to reach a broader audience. Content jammed at the bottom of publications is one method of expanding reach - but people call this type of amplification “recommendation” like Outbrain, Yahoo, Taboola, Gravity etc. It’s a lower cost method to push content on top publications, however, the performance is on par with standard ad hole insertion or less. This type of content amplification doesn’t constitute in context content marketing, however, some publishers have seen successful cross promoting content and others have not using these method. What’s Native Advertising and Types of Native Ads? Sponsored Text.Here we break them down into their visual components. Google was the first to introduce native at scale with the insertion of text ad in the search stream. Now text ad can be found on most publications. For publishers looking to get some montization and Google AdSence like placement this method will be around for some time. Sponsored or advertorial content is the most expensive to deploy and time consuming. Many brands have achieved success with this type of native advertising, however, for smaller brands this native method is cost prohibited. Smaller brands can achieve sponsored content like the “In Post” method below. In Stream or promoted post is the most popular form of native advertising, unfortunately, most is out of context and doesn’t enhance the consumer experience vs just clogging up one’s feed. On mobile you’re forced to interface with this type of in feed sponsored content hence why mobile video and in stream ads obtain some of the highest CTRs in the business. This is the newest form of Native advertising whereby the native unit is in context to the content around it. Native ads done well create a more reliable experience for the consumer than an obtrusive, in-stream ad that isn’t in context. Brands are seeing higher CTR (1 to 3%) on both desktop and mobile due to relevance. A great example is a publisher creating content on the latest refreshment ideas for summer with a Starbucks native ad unit about their latest refreshments, changing in real-time. The in context native ad provides value to the content around it and it is an overall better experience. No wonder these real-time native advertising units get more engagement. Content amplification doesn’t have to be hard just smart. For more depth on native advertising see our latest post on SEJ. On domain visual content marketing is very effective. You have a captive audience on your website or mobile application, however many brands fail to surface the right content throughout the consumer engagement path. Here DGDG, a large automotive dealership in the bay area, powers their thank you pages and main content HUBs from their 14 auto brands top content. Most brand’s thank you pages, purchase exit pages, etc. are dead and they are missing a big opportunity to re-engage with their customers with fresh content and Close the Social Loop. You have their attention so put your best foot forwards. Brands require an innovative approach to the way they display visual content and accessibility especially on mobile extending the discovery process and site stickiness. Pinterest style layouts are proven visual interfaces to increase consumer engagement and share rates. Smart brands are combining data intelligence and visual content based on consumer behavior to their advantage surfacing real-time trends to induce higher engagement wherever the consumer is at. Many publishers create sponsored content for brands, however, this type of publishing can be expensive. The unique element on the right created by SocialMoms was including a real-time native ad for Princess Cruises. 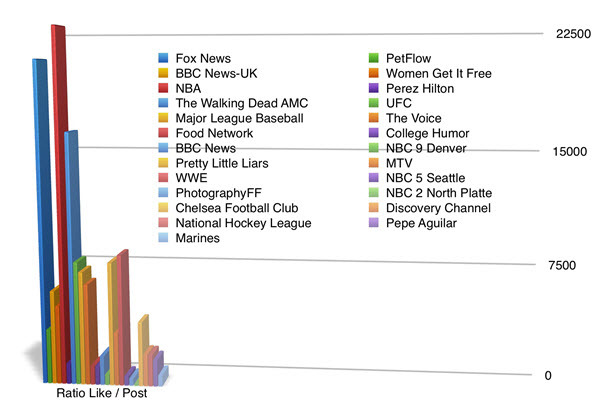 The unit is leveraging trending content from Princess and distributed in a native unit over the SocialMom’s network. Content is created as part of the native unit to increase greater context. Princess Cruises native units achieve 20X great CTR than industry averages due to dynamic images based on consumer data and smart placement. Mobile content display is lacking on most brands and the use of data on consumers to create a better user experience is almost non existent. A great example is the mobile interface on Disney. Here we have a static layout, content change is infrequent vs user engagement driving content changes based on trends or past behavior used in an Instagram layout structure. Brands that integrate Infinite scrolling, simple sharing and adaptive interface increase time on site. InfiniGraph’s vector scaling and adaptive content design for any content type provides flexibility to content published by the brands in a robust mobile interface. You followers are coming to you site on mobile devices especially if your amplifying content over native networks like Facebook etc. Here are a few tip to consider when developing a strong mobile strategy. Observe what users are trying to accomplish. Derive patterns from their behavior. Create the content Features (infinite scrolling, swiping, touching) that they do on other apps. Both design and user experience are critical. Smaller screens require simplicity is crucial. Remove everything superfluous from the UI. Only show elements to the best advantage. Content is delivered to the right user at the right time and place. Want to download the slides? Tell us what you think, what content marketing and amplification techniques are working for you. DGDG wanted to increase their customer time on site and achieve greater interaction with their content. Each of DGDG’s dealerships are creating outbound content yet there wasn’t a central area to discover all of the content unless you found each new post on each individual site manually. They also needed a way to cross promote their content in real-time based on the most engaged content greatly increasing their total content exposure. Would you like to see how they launched their native content amplification? Registration is free. DGDG, the largest family owned automotive group serving the entire San Francisco Bay Area. Click through to see Native content amplification over all dealerships in action. Leveraging InfiniGraph’s real-time native advertising solution they were provided with content recommendation and content amplification over all of the DGDG sites. All content is analyzed to obtain a Trend score based on engagement which is then packaged within a native insertion unit used to visually surface their trending content. DGDG placed these units in strategic areas on their site. Consumers are most engaged when they are given engaging content. This sounds intuitive yet most brands have static text, dead visuals, and bland thank you pages after a customer performs some action. DGDG Native Content Insertion thank you page. Smart use of tending content to bring customers back into a website. DGDG did it right and directed all entries and requests back to highly interactive, native content insertion pages with amazing trending visuals achieving 16.5% CTR back into their site. Every location has its own native content amplification HUB providing their customers with quick access to the latest automotive trends. DGDG took advantage of this turn key native content experience providing ongoing and consistent real-time content recommendations. Mobile optimized native insertion on DGDG mobile content. Screen shots from an iPhone 5s. All actions regardless of web or mobile created a slick user experience. Above is the mobile rendering of DGDG trending content. Would you like to see how to launch your very own native content amplification? Registration is free. Dollars, Bits and Atoms: A Roadmap to the future of marketing. Marketing is in a state of transition, driven by changes in technology, demographic and society. This map visualizes trends identified by industry leaders and experts showing relationships between technologies and marketing tactics, and where the industry is headed. How brands expose audiences to content and imagery to create emotional connection, awareness and demand. Delivering brands imagery, stories and information to customers through traditional and digital channels. Offering personalized experiences at the precise time, place and format that they are most engaging to consumers. How brands interact with customers and create differentiated experiences. Giving Customers a greater voice and provide new ways of users- created content and ideas to come to the fore. Technologies that allow us to physically interact with the digital world and vice-versa. Information from mobile devices, sensors, social media, public and third parties, combined with enterprise data. Data, media, automation and personalization combined to provide an immersive, quantified customer experience. This example is designed for travel and travel related posts. Native Advertising with the ability to detect past engagement on content types and updated based on consumer behavior. Click through to see the Content HUB in action. Bob’s marketing team finds that there’s too much content out there to filter through manually and find what’s relevant to their customers. They create a lot of content too but sometimes run out of ideas. Sometimes they don’t feel inspired. Bob knows that their social content isn’t getting enough play and they can’t distribute their content easily on their website. The excitement and novelty of social makes their website seem boring and old- bob wants more pageviews and engagement on their content. he needs to drive web visitors to see and engage with more content. And he’s not happy with the solutions he has for partner content and advertiser content. What’s more, showing content that’s mobile-compatible can be problematic. And most of all, he knows he doesn’t have enough people to get all these things done, and his people don’t have enough time. In one internet minute there are 3,000 photo uploads, 100,000 new tweets and 30 hours of YoutTube video uploaded. How could you ever hope to keep up if you’re doing it manually? Social media is great but creates a lot of business problems! so what can Bob do? Announcing InfiniGraph’s new Content Hubs. Based on InfiniGraph’s competitive performance monitoring capability content hubs are like the Buzzfeed for brands, you can find out what’s trending, what’s the hottest content in your niche. Your content hub looks at social content from wherever you choose, like the facebook twitter and instagram of your brand, your competitors and your partners. Content hubs aggregate the hottest social media content according to your customers interaction with it. You can easily tweet, facebook any of this content to your corporate accounts. You can distribute your entire hub as content itself, and you can use its hot content as inspiration for what to create next. Distribution is no longer a problem, because Bob can place his content hub at all his customer touchpoints on his ecommerce site, in outbound emails, on their website, blog and in facebook posts and tweets. Putting this highly relevant and proven engaging content on his site boosted interaction and time on site. And Bob also discovered that as this distributed content is clicked on by his website visitors, that became part of the trend too. This viral loop let customers enhance the ranking of their favorite content. Many websites today use widgets to show you other hot content on their site you should check out. And they inject native ads- ads that look more like content than ads. Bob was able to us InfiniGraph’s content hub to inject their content into partner sites and to inject partner and advertiser content into these custom widgets on his site. This boosted revenue for his company and made his advertisers a lot happier. Notice how below the recommended articles on their own site, Business Insider places a row of links to sponsored content. Up til now only top publishers have had this capability. That widget content starts with the hottest content InfiniGraph has found, but you can also inject your chosen content into it at will. Bob didn’t have to worry about how the content hub showed on mobile, because InfiniGraph’s display of the content is mobile-friendly and worked great. InfiniGraph did a lot of the aggregation and selection work for Bob and his team. They easily aggregated content from their entire industry, the most engaging content first. Your content hubs can be hand-picked. for some of their content hub uses, bob and his team wanted more control. It only took a few minutes for them to cherry pick their favorite content, and eliminate other posts. They could instantly add to or change this content with InfiniGraph’s hypercuration™ tool. In the end, Bob and his team found that InfiniGraph’s Content Hubs saved them a lot of time and made their social media and content marketing a lot more powerful. With all that new and hot, so easily organized and distributed, Bob and his team could spend more time enjoying the social experience with their customers and making impressive reports about how much their engagement and sales had jumped up as a result. Maybe it’s time for your company to check out InfiniGraph’s Content Hubs. Contact them for a demo at InfiniGraph.com. Try this live pet industry hub http://bit.ly/mobilehub or see more here powered by Hypercuration™. If you’re a brand manger, part of content strategy, or on a creation team your job is HARD. The fact that content marketing is hot is an understatement. There is lots of research to back that up. Brands need more content but what type of content and, more importantly, what content quality will sustain a conversation around your brand? In our previous post, “What’s Engagement? How Data Driven Marketers are Crushing Content Marketing“, we had over 30 industry leaders provide input on how they are measuring engagement. There is no question that content marketing is now being called the new branding. Marketers are being bombarded with native advertising, real-time marketing, brand stories, content curation, eBooks and now Content Hubs. All being these content strategies are being used to create brand authority to lead generation. But, what are brands doing to harness consumer engagement insights to drive strategy? See more details on branded Content Hubs for retailers looking for higher engagement. If you’re team is creating point solution content, you’re missing out on creating sustainable audience engagement. Using marketing insights and data is critical in determining what content is working in your industry. Developing a rigorous engagement performance measurement is required to retain a competitive advantage. The conundrum we see is that most content creation teams suffer from under funding or didn’t get full management buy in. Be upfront with the outcomes you’re looking to achieve with a content marketing investment. Brands that are not using data-driven marketing are handing over their audience to their competition. Are you educating your customers and providing value through the entire life cycle? Brands are now becoming smarter about leveraging Insights, visual trends and Content Hubs to determine exactly what their audience engages on. This type of data will dramatically change your content marketing strategy. There is real BIG DATA around us in the form of the “content consumption graph” where the audience actions on content speak louder than words. This is truer as you get to a niche industry, where few if any are talking about it. Collectively organizing content engagement and segmenting it provides the content team a way to understand themes, which will improve content relevance and bottom line. Data driven marketing is upon us and those brands that have figured out how to leverage and gain executive approvals are dominating the share of voice in their industry. #1 What are your customers resonating on? What’s getting your customer’s attention? #2 Where is your audience engaging? What are they are sharing? #3 What are your customers acting on outside of what they are mentioning? What other brands have relevant content that customers act on? #4 Post relevant, valuable content that is of the right type and with the right frequency to achieve the highest possible engagement. #5 Add brands, blog and news sites that appeal to your customers and enable discovery of other sites your customers are engaging on. #6 Filter content type: This show you directly what themes of content are working best for your audience over many brands. #7 Consumer Interests: What are your customers into? #8 Monthly benchmarks are vital to compare your content performance with others. There are GREAT tools for managing content workflow like Compendium (acquired by Oracle), Kapost, and DivvyHQ. As the team gets larger, the challenges increase to manage the content creation process. Where brands are falling short beyond slick editorially calendars is understanding what their customers engage with and what to create that’s relevant. Developing content strategy requires looking beyond your own brand and seeing these social connections to your brand and what content is obtaining engagement. There is truly a gold mine in this ever changing data set. And, don’t forget to include a Content Hubs strategy if you looking to be the source of discovery. The world made up of connections and sharing of content on a massive scale. Brands need to understand how content is the new currency and who is engaging on what. Prior to creating and making up content you must have a clear understanding of what your industry finds relevant and the types of content that is working. For some industries the amount of competitive content being created is overwhelming and who has time to “monitor all this”? Keyword social listening is an integral part of the equation but brands that have been doing this for 5 years or more know it’s just another tool that requires complex keyword filtration. We are now in the Social Graphs era and must utilize more advanced forward looking techniques to be proactive in our consumer engagement strategy. The Tsunami of content coming from Facebook, Twitter, Linkedin, Google+, Instagram, Youtube and Pinterest (not to mention the many international platforms) has compounded the problem. You can’t just go to Comscore and Google and review all of your audience insights. People have moved from a keyword world to an interest graph world and the brands have to move too.